Snowmass Village, CO – As part of the 2011 FEATURED ARTISTS LECTURE SERIES, Anderson Ranch Arts Center is proud to host Huma Bhabha. Bhabha will present a lecture on her work and the inspiration behind it on Thursday, July 21 at 12:30 pm in Schermer Meeting Hall. 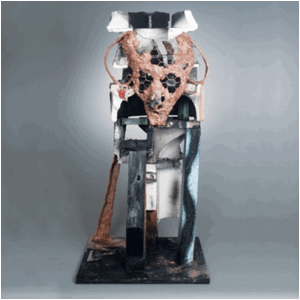 Huma Bhabha is a Pakistani-born artist who lives and works in Poughkeepsie, New York. Though originally trained in two-dimensional mediums, Bhabha is best known for her sculptures that address universal themes of colonialism, war, displacement, and memories of home. Since she began exhibiting her sculptures in 1993, her works have evolved from vaguely biomorphic floor pieces into assemblage-based masks, heads andfull-length figures that often reside on elaborated plinths. Bhabha constructs her work from discarded construction materials, found objects, and inexpensive media such as clay, chicken wire, leaves, Styrofoam, metal chains, paint, and wood. Her meticulous figurative fabrications are grotesque and often entropic, evoking mystery as well as a sense of suspended creation and decomposition. Bhabha was included in the 2010 Whitney Biennial and was a recipient of the 2008 Emerging Artist Award at the Aldrich Contemporary Art Museum (Connecticut). She has exhibited internationally in Europe, Mexico and Pakistan. Her work is included in the collections of the Whitney Museum of American Art (New York), the Saatchi Gallery (London), The Metropolitan Museum of Art (New York), The Museum of Modern Art (New York), and the Nerman Museum of Contemporary Art (Kansas).